I’m doing my best to stay current on France’s Jihad-Panic, but really, who can keep up? Now it’s pre-teens who are making the news. Last week, the authorities arrested an 8-year old near Nice for “glorifying terrorism,” the all-purpose speech crime that’s already generated dozens of fast-track convictions. Apparently the kid expressed doubts about a classroom “je suis Charlie” exercise; his teacher sent him to the principal, the principal called in the cops. Then there’s the 9-year-old north of Paris accused of interrupting his school’s minute of silence honoring the Charlie victims. He too was hauled into the local police station, where he was eventually cleared; the accuser turned out to be a classmate with a grudge– who could have seen that coming?. It’s not just happening out in the boondocks, either. In Paris, France’s Minister of Education vigorously supported the teachers’ actions, and the Minister of the Interior has set up a fancy Stop-Jihadism website. 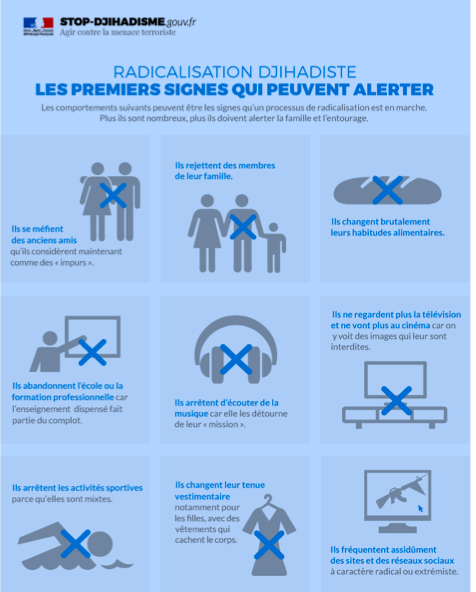 It includes this tip-sheet to help you identify kids going bad, complete with pictograms for the nine big danger signs — if your kids stop wearing their Dr Dre’s, for instance, it’s probably time to call someone, also if they stop watching TV and start dressing more modestly. Wasn’t it just recently that headphones, nonstop TV, and slutty clothes meant your kid was doing drugs? Now, historians come up against this kind of symbol-reshuffle in lots of fascinating contexts, and they’ve developed a long list of interpretations to explain how it happens. There’s the example of totalitarian societies, in which dictators decide that yesterday’s party line is today’s deviation (of course that’s a big theme in George Orwell’s 1984). There are the panics caused by war and social crises, which have so often produced cultural crack-downs (as in the French Revolution of 1789 or 1950s America). And there are the more mysterious cases, where hard-to-pin-down social changes create sudden new fears. In medieval Europe, nobody worried much about witchcraft, but around 1600 educated people began to think that demon-worshippers were everywhere and that harsh measures had to be taken against them. Over the next century there were thousands of executions, mostly of old women and poor men. Then it all stopped, and by 1750 believing in witches meant you were a weirdo. Eventually, historians are going to write brilliant books about our current moment of culture panic. For now, though, just one thought about it: namely, that it’s a strange world in which consumer culture has become a centerpiece in how we Euro-Americans define ourselves– and our baseline normality, whose rejection constitutes existential danger. It’s a strange world, but also a logical one. After all, even as they alert us to Jihadism warning signs, governments in France and elsewhere are fighting hard to extend the sway of market forces and ensure that consumer culture takes up as much of the public sphere as possible. Maybe those pre-teens really do seem a danger to the Republic…. This entry was posted in Uncategorized and tagged Charlie Hebdo, consumerism, culture panic, France, terrorism on February 3, 2015 by jonathandewald.